Parks Canada's website is ten years behind. They think that Netscape is the dominant browser, and they've never heard of Internet Explorer or Firefox or Safari or Opera. "System Requirements... Browser: Netscape 7.2 or newer release." That's the Parks Canada website today. They are blissfully unaware of the fact that, in 2007, fewer than one in twenty viewers of the WWW use the Netscape browser. Screenshot of Parks Canada website. "System Requirements... Browser: Netscape 7.2 or newer release." For a full-size view, click on the image. Note that Parks Canada's screenshot examples are so small that they are illegible. You are right, it should list the other browsers supported by this plug-in. The page / screenshot you posted here is the one that you get when installing the plug-in from a Mozilla-based browser. It has been tested with both Fire-Fox and ... yes, Netscape. So when installing the IE-based version of the plug-in, you're getting a different message. As for Opera, since the plug-in is an ActiveX, the IE version is not supported in Opera, but the Mozilla-based adaptation could be tweaked to also support Opera. We didn't get much demand to support this browser yet, but we'll consider adding support for it in furture releases. On the Mac side, a plug-in version has not yet been developped for OSX, meaning Safari is not supported at this time. We could provide further information if you require. Thanks for porting this to our attention. Thank you for your comments. I can't say much in response, because I don't understand most of your post. I'm reminded of that old BBC series "Yes, Minister" -- I feel like Jim Hacker after Sir Humphrey has explained some obscure point of administrative procedure. Perhaps Parks Canada should ask a civilian to look at its website and see if it makes sense to someone not on the inside. From your comment, I understand that providing further "system requirements" information in these installation pages is rather misleading and not so helpful. We really appreciate "civilians" taking time to comment our work so we can improve and provide a better web experience. We will be taking action and update these pages based on your comments. Many thanks for bringing this to our attention. On the technical side (briefly, promised) all you need to know really is that there are only 2 PC versions of the plug-in: one for Internet Explorer and one for Fire Fox / Netscape. We will consider fixing the Fire Fox/Netscape version so it could also be used with Opera. iSite's plug-in is simply not available for the Mac at this time meaning Safari is not supported neither are Mac versions of Netscape, Fire Fox, Opera and Internet Explorer. Thank you for this further clarification - and it really is clearer now. 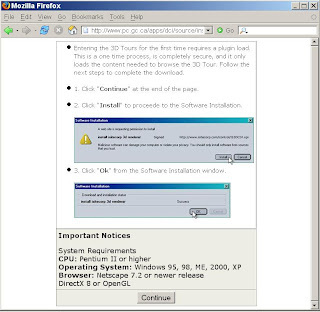 Re: "we hope you enjoyed visiting our 3D Tours' website", when I saw the statement "System Requirements... Browser: Netscape 7.2 or newer release", I promptly abandoned that exploration and went somewhere else. Re: "We really appreciate 'civilians' taking time to comment our work so we can improve and provide a better web experience..." That's great. I had no idea. "The Government of Canada has designated more than 800 sites, 500 persons and 300 events as being of national historic significance." I'd like to look at a list of these "800 sites, 500 persons and 300 events". On several occasions, over the last twenty months or so, I've tried to find this information, without success. I cannot understand why PC does not make suitable links of this text. "800 sites" should be a link pointing toward a list (HTML, not PDF) of these 800 sites. Same for "500 persons" and "300 events". To tell us that these things exist, but then to hide the details, passeth all understanding.